Title: INDICATIONS SEEM STRONG THAT IRAQI INSURGENTS NOW HAVE ANTI-AIRCRAFT CAPABILITY TO SHOOT DOWN OUR PLANES! Subtitle: Word surfaced weeks ago that Russia may have sold very sophisticated shoulder-fired missiles to Syria, who could then ship them to Iraqi fighters. Losing multiple planes in one week may provide the evidence that our air power is no longer unchallenged. This Iraq War may be about to become much more bloody soon. During much of this past year in Iraq, stories have consistently surfaced indicating that this war is running parallel to the disaster in Vietnam. In Vietnam, our forces relied heavily upon air power and air transport to make up for a lack of manpower on the one hand, while delivering supplies on the other. Military reality forced us to begin relying upon air resupply because the enemy was inflicting heavy losses upon our land-based convoys. History records that our effort to resupply through the air was a significant sign that we had lost the Vietnam war. Similarly, Coalition Forces in Iraq have used air power to make up for our lack of manpower. If you recall, a Pentagon general testified before Congress before the invasion began, saying that 360,000 men would be required to win this war and establish the peace. When we sent in only one-half that amount, our generals relied upon massive firepower to make up for the lack of soldiers. In Iraq, our land-based resupply convoys similarly came under heavy enemy attack, largely through roadside bombs. We have lost so many men and so much materiel through these attacks that we have begun relying upon helicopters and fixed wing aircraft to deliver the required supplies. The premise was that this course of action was safer, since we owned the skies and since the enemy had no effective weapon against our aircraft. Events during these past several weeks have indicated that this situation may be changing; if it is changing, we could lose many more aircraft, the war could become a lot more bloody, and we may have to throw in a lot more manpower, even if our leaders have to reestablish the military draft. Let us now examine the news stories which seem to tell the story. "New questions emerged today over whether the downed RAF Hercules was shot down or destroyed by an on-board explosion. Military experts believe the plane should not have been flying low enough for a low-technology terrorist missile to have reached it and some have suggested a bomb may have been planted on the flight. Another possibility is that some volatile equipment on the plane exploded halfway through its flight from Baghdad to the US airbase at Balad. "The 'effective range' of shoulder-launched surface-to-air missiles is between 5,000 and 10,000 feet, although it is possible that a freak missile could get higher, said an RAF source. The flight, which some sources say was at least 15,000 feet up when it exploded, came down 20 miles from Baghdad airport. Any normal transport flight would be flying at a height of at least 20,000 feet, probably higher, by the time it reached this point in its journey, precisely because of the risk of missile attack." Other news reports indicate that this C-130 transport plane was, indeed, flying nearly 20,000 feet high, thus making it improbable that anti-aircraft missiles could have brought this plane down. Since we also have trouble believing that on-board sabotage brought the plane down, hostile action cannot be ruled out, even if the weapon does not seem to be an anti-aircraft missile. Let us now examine some other news stories which seem to indicate that insurgents do have anti-aircraft capability -- very effective against low-flying aircraft. "The US yesterday suffered its worst day in Iraq since the war began when a marine helicopter crashed in the western desert and insurgents launched a new wave of attacks, leaving a total of 37 Americans dead ... Yesterday early reports suggested there had been no hostile fire at the helicopter crash site near the Jordanian border, and that desert fog may have contributed to the accident. A military inquiry was launched into the crash ... There were no reports of survivors on the three-engined CH-53E Super Stallion, the biggest US helicopter in military service." "BAGHDAD - At least 31 US Marines were killed in a US transport helicopter crash near the western Iraqi city of Rutbah ... the US military in Baghdad confirmed the crash saying it happened overnight as the helicopter was transporting soldiers from the 1st Marine Division, headquartered in Fallujah. Witnesses said the helicopter appeared to have been hit by a surface-to-air missile and exploded on hitting the ground. A second helicopter also came under fire but was able to reach safety, the witnesses said." "Aljazeera has aired a video showing a purported Iraqi group firing missiles at the British C-130 transport plane which crashed on Sunday afternoon northwest of Baghdad. The video, issued by the military wing of the 1920 Revolution Brigades, also showed an explosion at a distance and what appeared to be the debris of a plane on the ground ... 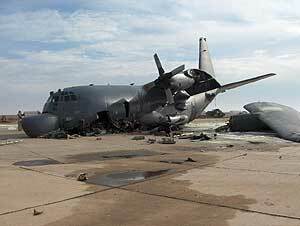 The Royal Air Force C-130 Hercules went down at 4.40pm (1340 GMT) on Sunday ... the number killed in the crash was 10. The British government later said nine Royal Air Force personnel and one soldier were missing and believed dead. The crash is Britain's biggest single military loss since the invasion of Iraq in March 2003." "The Sun newspaper said it had been told the plane exploded at an altitude of 4500m, too high for such a missile to strike. Citing what it called a 'senior Ministry of Defence insider', the paper said military investigators were instead looking into whether a bomb had been placed inside the plane. 'It is clear the C-130 exploded in mid-air and shattered into thousands of pieces', the source told the paper's Tuesday edition." 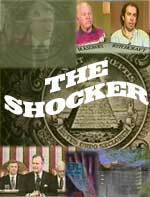 Officials were quick to discount this video, noting tiny irregularities in the film which seemed to indicate that the video had been created for propaganda purposes through sophisticated video techniques. A second problem is that 4500 meters is nearly 15,000 feet, much too high for shoulder-fired missiles. In our NEWS2003, above, we quoted DEBKAfile as saying that the Russians had possibly introduced SA-18 shoulder-fired anti-aircraft missiles into the Middle East, and that our experts were worried that this missile would be shipped to Iraqi insurgents. A check on the equipment capabilities of the SA-18 anti-aircraft missile shows that its height limit is 6,900 feet. This reality means that, while helicopters and lower altitude fighter aircraft were susceptible to the SA-18, a C-130 Hercules flying at nearly 15,000 feet would not be. 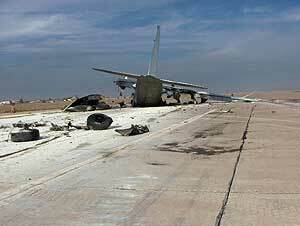 "Today a C-130 Hercules crashed in Iraq. According to witnesses, the wreckage was spread out over a wide area. Anyone familiar with aircraft accidents will confirm that this indicates that the aircraft came apart high in the air, not on impact with the ground. A week ago, a helicopter crashed in Iraq, killing 31 people. Officially blamed on the weather, reports from the crash site indicate the wreckage covered 2 square kilometers. Again, this strongly suggests that the helicopter came apart high in the air. The Baghdad meteorological office confirms that the weather was clear with only moderate winds and no sandstorms at the time of the crash. "The bad news is that the Iraqi people have gained the ability to shoot down our aircraft." The reality may be a little more complex. 1) The insurgency may now possess the Russian SA-18 shoulder-fired anti-aircraft missile which would be effective from 200 feet to 6,900 feet. The page detailing Russian SAM capabilities indicates that the SA-18 has already been shipped to the Middle East to Iran and Iraq. 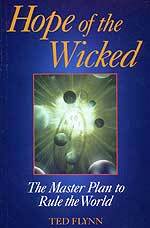 2) Russia may be using their scalar weapons technology to shoot down higher-flying aircraft. If you doubt the Russians would intervene like this against America, go back to our NEWS2003, reading carefully Putin's stark warning that he would not tolerate any more invasions, attacks, or any measures designed to bring about a "Regime Change". A leader who cares about his international standing will not make threats like this unless he is prepared to back them up. The leaders of Germany and France sat behind Putin as he uttered his warning. If our aircraft superiority is now challenged, events could turn very bloody very quickly. Without adequate manpower on the ground already, our military would suddenly be under great strain. If President Bush does not pull out, might he turn to a military draft to quickly bring large numbers of Americans into the military? We seem to be close to an escalation of war in Iraq. Once the President's State of the Union address is completed, and once the planned election results are announced, be prepared for a bloody escalation of this war.